Brasília (AFP) – Brazil’s lower house of Congress opened debate Friday on impeachment of President Dilma Rousseff ahead of a vote this weekend that could seal her fate. Hours earlier, the Supreme Court rejected an 11th hour bid by the increasingly isolated leftist president to have impeachment proceedings suspended. The lower house has power to throw out the impeachment when it votes Sunday, but if it votes in favor, as seems increasingly likely, Rousseff will be sent to trial in the Senate. The struggle has transfixed Latin America’s biggest country, where the crisis, deep recession and a giant corruption scandal, have overshadowed preparations for the Olympic Games in Rio de Janeiro this August. House Speaker Eduardo Cunha — who despite facing serious corruption charges has positioned himself as the architect of the push to remove Rousseff — predicted an intense debate. Rousseff, accused of illegal government accounting tricks, is unpopular across the country and reviled by the opposition. A former Marxist guerrilla, Rousseff was imprisoned and tortured under the military dictatorship that ruled Brazil for two decades until 1985. Recalling that bitter experience, she has branded the attempt to remove her from office a coup. Folha de Sao Paulo daily put the pro-impeachment count at 338, just under the required 342 votes out of a total 513. 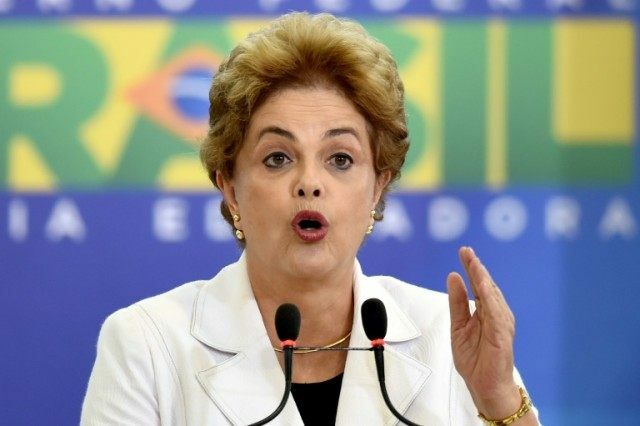 Rousseff says she will not go quietly. “The government will fight until the last minute of the second half… to foil this coup attempt,” she said Thursday. She hoped the Supreme Court would be sympathetic to her lawyer’s claims that the impeachment proceedings had been turned into an open-ended attack that disregarded legal norms. But in an emergency session that went through the night into Friday morning, justices voted overwhelmingly to turn down the petition for injunction, several pointing out that the Senate trial was the moment where the substance of the case could be argued. Despite accusing her vice president, Michel Temer, and the house speaker — the two main leaders of the impeachment drive — of “treachery” and coup plotting, she has also promised opponents compromise if she is allowed to stay in office. But the collapse of Rousseff’s coalition has been relentless, starting with the defection of Temer’s PMDB. Temer, a lawyer with little public support but well-honed skills at backroom dealing, will take over as interim president if the trial starts in the Senate. Rousseff would have to step down for 180 days during the proceedings. If the Senate then voted by a two thirds majority, she would be ousted and Temer would remain in the presidency.